Chromebooks have great potential and are starting to make more of an appearance in schools, however Chromebooks will not fulfil everyone's needs. Chromebooks are backed by the power of Google and run on Google's operating system (Chrome OS.) Chromebooks have various advantages over most iPads and netbooks and laptops, including. Their price point; Chromebooks retail from $AU329. Their start up time (approx 8-15 seconds, depending on their configuration). Most schools are already making the switch to Google Chrome Apps and Google Apps for Education to deliver lesson content, all of which are the backbone of Chromebooks. They are primary designed to rely on a working internet connection (as many of the built-in apps are designed to be used whist the user is connected to the internet) so some of the more popular apps on the Chromebook may not actually be able to be used/saved if users do not have access to an internet connection. They generally only have 16GB of local (in-built) storage as they rely on users signing up for a free 100GB of online storage via a linked Google Account. Various apps that Chromebook users need can be also be used by anyone with a Windows, Mac or Linux PC by using the Chrome App Launcher. The amount of apps in the Chrome Web Store cannot compare to that of Apple's App Store or the Google Play store (Google have recently adapted four of Android's most popular apps to be suitable for Chromebooks). Microsoft and HP are currently working towards releasing Windows-based laptops to compete with the price of Chromebooks1. class sets (e.g. 1 Chromebook for every 5 students). the implementation of age restrictions for apps . Schools do not have ongoing costs (such as the purchasing of apps or the fixing of broken screens). Students and parents are responsible for maintenance and care of their device and may need to purchase an extended warranties in addition to any standard warranty. Accidental damage or stolen devices may be covered under a school's insurance plan. Manage Chromebooks at an individual, class or whole school level including setting age-restrictions on apps. Whilst schools can set up restrictions on Chromebooks and restrict internet use via school filters, there are also various options for the real-time monitoring and restricting of Chromebooks. NetSupport Assist for Mac/Linux and NetSupport School for ChromeOS and Google Chrome Browser (All Platforms) (student | tutor), Android (student | tutor), iOS (student | tutor, and Windows are both paid (with a free 30-day trial) management solutions that gives teachers the ability to simultaneously instruct and visually/audibly monitor, as well as interact with their students, individually, as a pre-defined group or to the whole class. 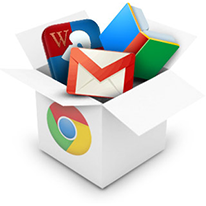 The Chrome Web Store allows users to download and purchase apps, extensions and themes for the Google Chrome browser (or Chrome OS device). Read below for a list of highly useful apps available for download in the Chrome Web Store for both personal and educational settings. Note: As many of the apps on the Chrome Web Store are web-based apps, some can be added into the Google Chrome browser on a Chromebook, Windows, Mac, iOS or Android device. Simply look for the "+ Add to Chrome" button. Click here to learn more about Chrome Apps for Windows/Mac/Linux or navigate below to discover more about the Chrome apps that are suitable for use in educational settings. Whilst apps can be purchased from the Chrome Web Store (see more details and reviewed apps below), Google has created Chrome App Packs consisting of groups of popular applications from the Chrome Web Store that are tailored to meet students' needs. The App Packs are only available for Google Apps for Education customers. The apps can be accessed when users sign in to their Chromebook and are also available on a Windows, Mac, or Linux computer when users sign in to the Chrome browser with a Google Apps account. The App Packs save teachers time, offer discounts for bulk app purchases, and help teachers find the best apps by category and grade level. Many of these apps integrate with Google Drive to provide an easy way to turn in homework, and many of these apps offer lesson plans for teachers. Free: These apps are provided free of charge. Freemium: These apps are provided free of charge, but a premium is charged for advanced features. Paid: Many of these apps come with a demo version, but cost money to use the full version. Click here to learn more about how to deploy the App Packs. There are a number of apps and software packages that can be used to disseminate lessons and activities in whole-class, small group and one-to-one scenarios. Splashtop Education allows teachers (or students) to share content from a PC or Mac simultaneously across multiple Chromebooks, iPads or Mac OSX screens, allowing a user to control, annotate and then share content to every students' one-to-one device. Teachers: (Splashtop Education) Promotion $10/per teacher for 1st year: $50 per teacher, per year, after year 1. For Site License contact sales@splashtop.com. Download from a 14 day free trial here. 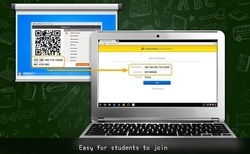 Students need a QR Code Reader installed on their Chromebook to scan the QR code from the teacher's screen to activate each learning session. Download Smoothboard Air for PC from here (Note: Also requires Microsoft .Net Framework 3.5 Service Pack 1 - download it here). PC or Mac by installing BlueStacks and then downloading Chrome Remote Desktop. The following apps are directly aimed at enhancing the productivity of students and staff. Whilst Chromebooks are naturally designed around the use of Google Drive, Docs, Sheets and Slides, Microsoft Office is also available to Chromebook users. Once the Office Online apps has been launched, sign in via a Microsoft Account, click on File and select Share to enable others to access and edit your document/spreadsheet/presentation. If the user(s) already have a legitimate copy of Microsoft Office on a Windows or Mac PC, they can continue working with the full power of Word, PowerPoint, and Excel applications. Description: Create, edit and share Microsoft Excel spreadsheets. Description: Create, edit and share Microsoft PowerPoint presentations. Description: Create, edit and share Microsoft Word documents. Description: Whilst Skype is not available for ChromeOS, Hangout allows Chromebook users to video chat with up to 10 people, regardless of whether the person/people they are talking to are using a Chromebook, PC or Mac, Android or iOS device. This app can be useful for communication when students are working in projects outside of school hours. Description: Evernote saves both the audio and the text file together so users can use the app's search ability to find a recorded note. Description: QR-Codes from URLs, Text Messages, Phone Numbers, Free Text or Contacts (vCard). It also allows to scan/read QR Codes if a webcam is available. Description: Create comics using the Chromebook's camera and the filters and camera effects contained with Comic Webcam. Description: This app was developed to help children learn 220 sight words. This app works offline. Due to the infancy and the open source of Chrome OS, before installing any apps from the Chrome Web Store, always read the user reviews.